BEIJING, Nov. 8 (Xinhua) -- Chinese President Xi Jinping met with former U.S. Secretary of State Henry Kissinger in Beijing Thursday. Calling Kissinger an old friend of Chinese people, Xi hailed the "historic contribution" he has made to China-U.S. relations. 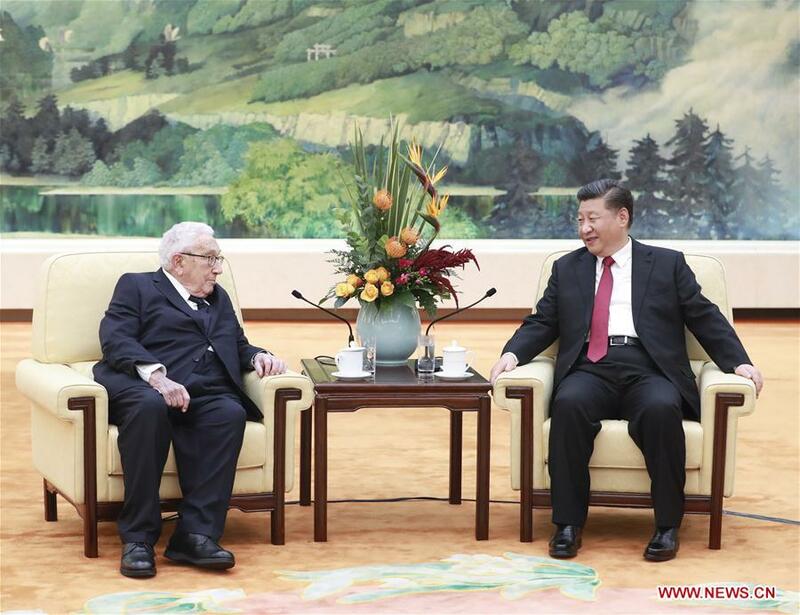 "We will not forget that," Xi told Kissinger. As the world today is undergoing unprecedented changes that have not been seen in the past 100 years, it is the international community's expectation that China-U.S. relations will continue to move forward in the right direction, the Chinese president said. "I have agreed with President Trump to meet during the upcoming G20 summit in Argentina, where the two sides can have an in-depth exchange of views on issues of common concern," Xi said. It is noteworthy that negative voices concerning China have been rising for some time in the United States, Xi said, adding the two countries should have a precise judgment of each other's strategic intentions. "China sticks to the road of peaceful development, and is still committed to the building of a relationship with the United States that features no conflicts, no confrontation, mutual respect and win-win cooperation," Xi said. On the basis of equality and mutual benefits, and in the spirit of mutual understanding and mutual compromise, China is willing to properly resolve issues emerging in bilateral ties through friendly consultations with the United States, he said. Xi called on the United States to respect China's rights to develop according to the path chosen by itself and respect China's legitimate rights and interests, meet each other halfway and jointly safeguard the healthy and stable development of bilateral ties. Kissinger said he is pleased to meet Xi in China again at a critical moment when Sino-U.S. relations have entered a new stage. He recalled that he had visited China many times over the past decades and witnessed China's development. Cooperation between the United States and China is essential for peace and prosperity in the world, Kissinger stressed, praising China's efforts to this end. He noted that developing U.S.-China relations demands strategic thinking and foresight, adding the two countries need to deepen their mutual understanding, strengthen their strategic communication, constantly expand their common interests, and properly handle their differences, to show the world their common interests are much bigger than their differences. Kissinger said he hopes Trump and Xi's upcoming G20 meeting will be a success. Chinese State Councilor and Foreign Minister Wang Yi also met with Kissinger on Thursday.